Global coverage that follows you. Ideal for short or long term use. Stay connected anywhere you are. The Iridium 9555 satellite phone is compact, light, and easy to use but with industrial-grade ruggedness...and it's connected to the only truly global mobile communications network. The Iridium 9555 Satellite Phone features a redesigned and highly intuitive user interface, making reliable communication more efficient than ever. We make it so easy that you can start making calls right out of the box, skipping the traditional learning curve - and maybe even the need for a user manual. With 21 supported menu languages, the Iridium 9555 Satellite Phone offers the best in native language support for global phone users. Compact physical footprint for streamlined portability. Intuitive user interface for out-of-the-box functionality. Water, shock and dust resistance for unparalleled durability. Enhanced SMS and email messaging capability. The only network that can offer you pole to pole coverage for voice, data and SMS services. Talk to an iRoam Iridium expert. 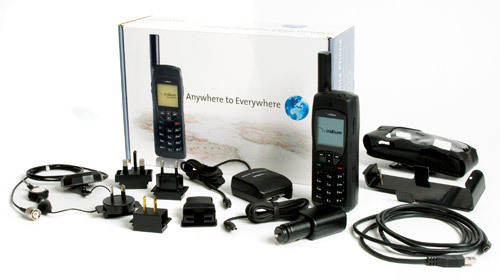 We offer a variety of prepaid airtime and satellite phone kits to suit your needs. Enjoy low rates and global coverage with no contracts and no activation fees.